This post was written by Evelyn Rupert. In April 2017, the USAID-funded Innovation for Agricultural Training and Education (InnovATE) project convened a workshop on Opportunities for an International Teacher Certificate Program in Agricultural Technical and Vocational Education and Training (ATVET) in Central America at EARTH University in Costa Rica. Forty-two representatives from Guatemala, El Salvador, Honduras, Nicaragua, Costa Rica and the United States participated. They included ATVET teachers and directors, policymakers from the Ministries of Education and Agriculture, industry and support ATVET organizations, such as donors, implementers and consultants. These organizations were invited to make presentations on their work. We wanted to share some of what we learned with a larger audience. At the workshop, Reinaldo Sánchez, monitoring and evaluation specialist for the USAID-funded project Aprendo y Emprendo, presented How USAID TVET-SAY Nicaragua supports Technical-Vocational Education in the Agricultural and Forestry Sector. We asked Aprendo y Emprendo to share what they are doing to improve the capacity of the technical and vocational centers in rural Nicaragua to provide education and training and how the project involves the private sector in those capacity development efforts. Crouched behind an engine on the back of a small motor boat, 19-year-old Soliange Pollack cranes to see the tiny screws she is twisting. Training has taught her how to keep her tools steady as the boat rocks on the waves. 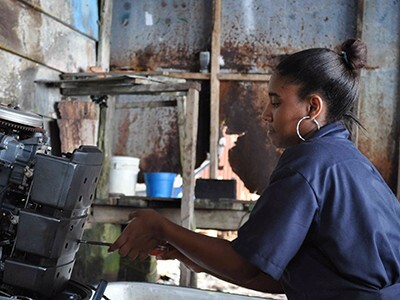 With help from a USAID-funded project, Soliange is pursuing a career in outboard motor repair, a key skill in her community of Bluefields, which relies heavily on the fishing industry. She is one of 294 students from the Caribbean Coast region who has received a scholarship to pursue her education through a project called Technical Vocational Education and Training Strengthening for At-risk Youth, better known by its Spanish name "Aprendo y Emprendo,” which is implemented on behalf of USAID by Creative Associates International. Through scholarships and by shoring up the region's network of vocational training institutions, Aprendo y Emprendo is working to build opportunities for at-risk youth across the Caribbean Coast. Some 75 percent of people in the region live in poverty or extreme poverty, far higher than the national average. Youth average fewer than three years of schooling and often lack soft skills, leaving them ill-equipped to find the jobs that become scarcer the farther they live from the capital of Managua. To improve livelihoods in this rural area, Aprendo y Emprendo will award a total of 1,000 scholarships to youth like Soliange to pursue various technical careers. The project is also working with eight technical vocational education institutions to increase their ability to reach at-risk students. Aprendo y Emprendo offers in-depth capacity training courses to technical vocational training providers and gives them technical assistance in developing modern curriculum, 21st-century pedagogy skills, strategies for sustainability, monitoring and evaluation systems, soft skills development, and policies to ensure inclusiveness for ethnic minorities, those with disabilities, women and LGBT youth. With the agricultural sector employing more than 30 percent of the workforce in Nicaragua, universities and vocational institutions supported by Aprendo y Emprendo offer students technical degrees in an in-demand field. For example, the project is providing support and scholarships to Bluefields Indian and Caribbean University, which offers a two-year intensive course in agriculture. Technical training institutions like Fundación Victoria in Managua, where several Aprendo y Emprendo scholarship awardees are enrolled, offers a degree in industrial engineering for food processing. Twenty-four students are currently enrolled in a two-year technical program in the municipality of El Rama, which is one of the country’s most productive areas of tropical products like cacao, coffee and coconuts. In the Caribbean Coast region, there is huge potential for the agriculture industry to grow and benefit from skilled technicians. A survey found that more than 80 percent of agricultural producers have never received technical education training or assistance. By bolstering these institutions and helping Caribbean Coast youth pursue technical careers, Aprendo y Emprendo will introduce qualified and well-trained employees to one of the regional economy's largest drivers. The project depends on the support of the private sector to ensure that students’ newfound skills meet market demand. Aprendo y Emprendo is bringing businesses and training institutions together to co-develop courses and build relationships that can strengthen technical sectors and increase youth access to employment. The project recently created the Nicaraguan Network for Technical Education (RENET) comprising technical education institutions and business associations. The network, the first of its kind, is aimed at aligning schools' curricula with demand from the private sector, allowing graduates to be better suited for the job market. RENET is complemented by a smaller, regional network of employers, training institutes, universities and non-governmental organizations in the Caribbean Coast agricultural sector to link labor demand in the industry with academic offerings. More than 70 percent of businesses in the Caribbean Coast reported difficulties finding workers knowledgeable in their field, and half of youth are lacking the skills required by businesses, particularly soft skills. With the creation of the networks, employees and training institutes are optimistic about opening the channels of communication to bridge this gap and improve employability among Caribbean Coast youth. However, the private sector in the Caribbean Coast remains weak, and the project has also turned to entrepreneurship to open windows for youth. Entrepreneurship trainings and collectives of recent graduates — primarily in the agriculture sector — will allow youth to build their own businesses. Aprendo y Emprendo has formed an alliance with Banpro, one of Nicaragua’s largest banking groups, and established a seed capital fund for startups to invest in nascent businesses. Aprendo y Emprendo’s holistic approach to workforce development will empower youth to improve their livelihoods and strengthen major technical fields like agriculture in the future. For more information visit Aprendo y Emprendo or Creative Associates International. Zamorano University has a unique and successful approach to agricultural education that supports agricultural technical vocatinal education in Honduras and depends on partnerships for much of its success.